Several scientific articles about rowing power were recently published by Dutch researchers (1, 2), which placed doubts upon the standard definitions of this important indicator of performance. In this newsletter, I will be reviewing this topic, which I last discussed in RBN 2004/06 (3,4). where Fo,r / Ff,r are the forces, which the object (rower) applies to the subjects (oar handle / stretcher), but vh/w - vb/w are velocities of the subjects relative to “something else” –the “world” reference frame. 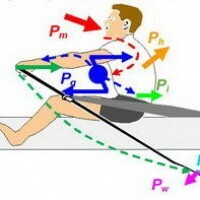 However, the outside world does not apply the force and power to the handle and stretcher – the rower does this, moving at some velocity relative t the outside world, so we must refer to the rower’s centre of mass (CM), not to the “world”. According to the erroneous equation 2, the rower’s power depends on other external factors: a rower applying the same handle force and velocity, would have higher power in bigger/faster boats or in a tailwind, and in small/slower boats or in a headwind the power would be significantly lower (up to 20-30% difference), which should not be the case. Moreover, the “world” reference frame was related to the shore, not to the water: in this way, the rower’s power depends on the speed of the river current, which is completely untrue. 3. “Rower’s power” bound to the rower’s CM. In the “traditional” method, I noticed that the boat is not an inertial reference frame, because it moves with acceleration, and this was confirmed in the referred articles. This means, say, at a 2g boat acceleration, moving a 10kg mass would require 20kg of force, similar to lifting up a weight inside an accelerating rocket (Fig.1). However, if the force and velocity are measured directly, the gauge will show 20kg of force, so the power calculations are correct. The power created between the pin and the oar handle can be called the “Net power”, which is transferred through the oar shaft to the spoon, so this is the only source of energy which moves the rower-boat system forward. This power is measured directly and correctly with our BioRowTel system and the NK EmPower oarlock. The 2nd power definition describes the Net power transformation at the blade, where it is divided between the Propulsive power, which propels the rower-boat system and Waste power lost in blade slippage. Both components are difficult to measure directly, so this method is not practical. The 3rd power definition is in the rower’s reference frame and could be called “Gross power”, which is applied to both the handle and the stretcher in the ratio of about 60%/40%. Gross power is higher than Net power by 4-7% of inertial energy losses spent on the relative movements of the rower and boat (RBN 2010/05). Gross power is also not very practical to determine: measurement of the horizontal stretcher force is complicated, and the velocity of the rower’s CM is quite hard to determine. Also, definition of the Gross power could be extended by the energy that the rower spends on the vertical movements of the oars, friction on the slides, etc., so this method is quite uncertain. Fig. 2 schematically shows the process of energy transformation in the rower-boat system. The rower consumes Metabolic energy Pm and applies mechanical Gross power Pg to the oar handle and stretcher (24-28% of Pm), while 72-76% of Pm is heating the rower’s body. About 6% of Pg is spent on inertial losses Pi and 94% goes to Net power Pn delivered to the blade, where it is spend on the Propulsive Pp (about 80%) and Waste Pw (20%) powers. About 6% of Pp is lost due to variation of the boat velocity (Pv) and the rest is effective propulsive power Pe. In conclusion, the Net power transferred from a rower to the external environment is the most important indicator for the evaluation of a rower’s performance. It is measured correctly and reliably with BioRowTel and NK EmPower systems. 4. Kleshnev V. (2016) The Biomechanics of Rowing. Crowood Press. 190 p. ISBN 978 1 78500 133 8.